After a short bus ride, we arrived in Córdoba, to the slight northeast of Sevilla. Home to the magnificent Mezquita (part mosque, part church), this smaller city possesses even more impressive examples of Moorish architecture as well as some famed Roman ruins. There are many hostels located right around the Mezquita (often the biggest draw to the region and city), and thus one has his or her pick of the litter. Nina and I stayed in the Hostel Al-Katre. Once again as a result of the season, the price was good, and we received our own room. After a night of recharging, we headed out into the city in search of some food and the buildings on our list to visit. Once our churros and hot chocolate were consumed, we headed to the Alcázar de los Reyes Cristianos, just outside the old touristic centre. With a cheap fee, this structure like the location bearing a similar name in Sevilla is a large garden complex. Pools and orange trees abound. Next door, there is also an equestrian club (we believe, as we saw some horseback riders). Careful of your step too! Some parts are very steep and if you are traveling with the frail/ wobbly … some areas are kind of inaccessible. Next, we headed to the Roman Bridge, which is … well … a bridge. Not that it is a particularly ugly bridge, but its name is pretty descriptive. Take a stroll; walk to the other side. That’s what bridges are for. At this point, I would say that although Córdoba is cute, it needs to be coupled with other locations in the region if one is touring, especially in the off season. 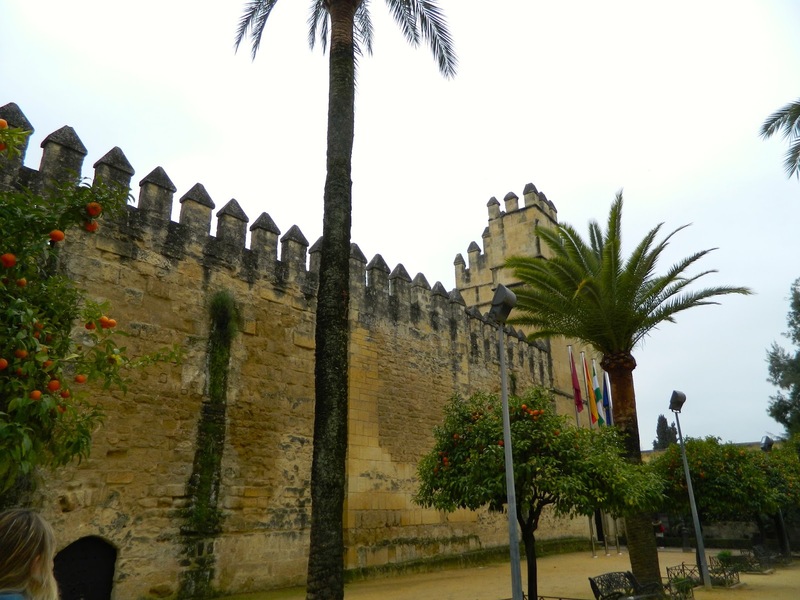 We went to Córdoba instead of Granada, which has the famed Alhambra. Much grander in scale, it is also more crowded and difficult to actually enter (not to mention expensive). Córdoba was the compromise. A site we could not easily locate was the synagogue unfortunately. Like most cities in Europe, there is/was a Jewish quarter. Córdoba is no different, but as it is already quite small, the quarter was just one street. Not functioning since the expulsion of Jews in 1492 (sigh …), the synagogue is rather inconspicuous nowadays. We apparently walked right past this now minuscule museum multiple times. Closed on Mondays, the price to enter if you are not from the EU is less than 1 euro. Enjoy the Sephardi stuccos. The Roman Ruins are another story. Once a temple, these pillars are located away from the Mezquita and are home to many stray cats who enjoy sunbathing and saying hello to tourists. They are quite visible and a great destination after a lunch in the square nearby. Finally, the crown jewel of Córdoba, it is hard to miss the Mezquita. Once a church, then with the addition of a mosque, so a mosque and a church, then just a mosque, then back to just a church, the Mezquita represents the historic power exchanges of the region. Although now it is only a functioning cathedral, the complex still features both Moorish and Renaissance influences, which continue to draw the tourists from around the world. A picture out of an art history book, the interior chambers of the Mesquita are an array of archways with gilded portraits and figures from its Christian influences. Simply breathtaking. And after the Mezquita, I suggest going to one of the many tapas restaurants surrounding the structure. Some are more touristy than others, but overall, if you want a cheap, quick bite — these are the places to go. Get the torta (and maybe also the albóndigas)! Next off, we headed to Málaga. A seaside, tourist mecca, we happened upon Carnaval festivities. It was also our parting of ways for Nina and I on this adventure. Bittersweet for sure. Stay tuned and guess what, we are going to Mexico in a month? I will explain later … Travel safe and often! 25. When you travel, try to stay in one location and revisit places once or twice. A restaurant will always appreciate a returning customer. 38. People often travel to escape and start fresh. I’ve done it; I am not ashamed. However unless you are truly nomadic, you will have to return to dwell in familiarity eventually. Always make sure you have a home waiting for you. Of course, “a home” is a loose definition. 65. Czech people tell you how it is, no little, no more. 102. Bureaucracy is a universal struggle in the United States, Canada, Chile, Israel … You really cannot escape it. 4. When a park ranger tells you to get your hands off a Giant Tortoise, you better get your hands off the damn turtle! 85. Never steal anything from the VIP section of the club. Just never. This should go without saying, but you would be surprised by the stupidity and insolence of some individuals.